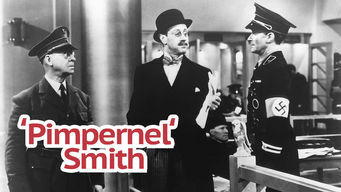 How to watch Pimpernel Smith (1941) on Netflix France! Sorry, Pimpernel Smith is not available on French Netflix, but you can unlock it right now in France and start watching! With a few simple steps you can change your Netflix region to a country like United Kingdom and start watching British Netflix, which includes Pimpernel Smith. We'll keep checking Netflix France for Pimpernel Smith, and this page will be updated with any changes. Pimpernel Smith is not available in France BUT it can be unlocked and viewed! A daring Allied agent poses as a bumbling scholar and stages a fake archaeological dig in order to shuttle refugees out of Nazi-occupied Europe. Behind that benign disguise lies a hero who's hell-bent on outwitting the Nazis. They have no idea what's coming. There is a way to watch Pimpernel Smith in France, even though it isn't currently available on Netflix locally. What you need is a system that lets you change your Netflix country. With a few simple steps you can be watching Pimpernel Smith and thousands of other titles!